Ofo, a dockless bike-share company, rolls into D.C. this week joining other dockless bike operations as part of a pilot program the District is trying. WASHINGTON — The streets of D.C. are becoming crowded with bike-share bikes with another addition rolling into town this week. Ofo, which started its bike-share business in 2014 in China, calls itself the world’s first, and largest, station-free, bike-sharing company. Ofo will deploy 400 of its bright yellow bikes throughout all of the District’s wards this week. Riders will pay $1 for each hour ridden, matching what other dock-free bike-share companies are charging in D.C. — that’s half the cost riders pay to use Capital Bikeshare’s docked-bike system, which has been operating locally for six years. 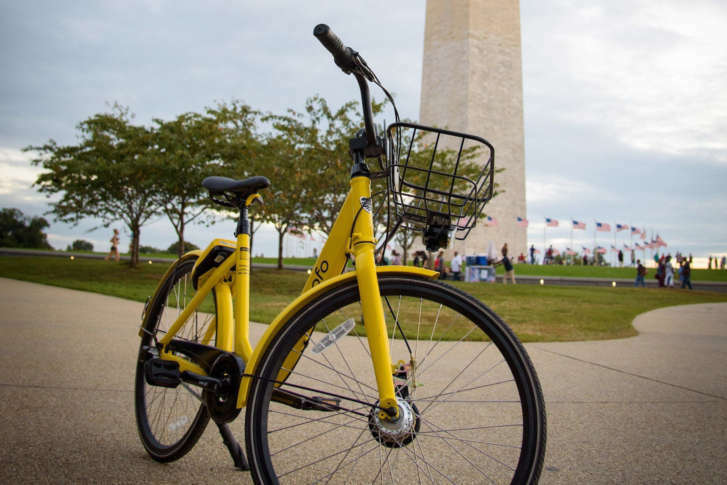 Like the other dockless bike systems rolled out in D.C., users download the ofo app to find nearby bikes, scan the QR code on the bike’s frame or smart lock, and lock it up someplace suitable when done. Ofo is a big player. The company reports that it has more than 10 million bikes deployed in more than 180 cities across 15 countries. Ofo joins Mobike, Spin and Limebike in D.C. as part of a six-month pilot program the District is trying with dock-free, bike-sharing programs. The District has called dock-free biking options a supplement, but not a replacement to Bikeshare. “Washington, D.C., is a great candidate for station-free bike sharing,” said Grace Lin, vice president of ofo U.S.